The first person to die of the deadly H5N1 avian flu virus in North America had just returned from China, Canadian authorities have confirmed. Officials said the victim, whose gender and other details were withheld to protect the family's privacy, had recently returned from a trip to Beijing. He or she died in Canada's western plains province of Alberta. Canada's health minister Rona Ambrose said it was the first known instance of someone in North America contracting the virus and stressed it was an "isolated case". "I want to reassure the public this is an isolated case and the risk of H5N1 to Canadians is very low," Ms Ambrose said. If this pandemic-ready flu virus did escape.....well, let's just hope it doesn't. Virologist Ron Fouchier of the Erasmus Medical Centre in the Netherlands lead a team of scientists who discovered that a mere five mutations to the avian virus was sufficient to make it spread far more easily. He conducted his tests on ferrets as the animals have become a model of choice for influenza and have similar respiratory tracts to humans. Paul Keim, chairman of NSABB, said: 'I can't think of another pathogenic organism that is as scary as this one. I don't think anthrax is scary at all compared to this." Nature couldn't get it right. So we had to give it a helping hand. Obviously, by the lack of updates, this blog is on a hiatus for the time being. The list of people who will be denied medical care during a full blown bird flu pandemic is long, and varied. The potential of a purposeful culling by care denial of the elderly and sick by regimes around the world is huge, and troubling. The proposed guidelines are designed to be a blueprint for hospitals "so that everybody will be thinking in the same way" when pandemic flu or another widespread health care disaster hits, said Dr. Asha Devereaux. She is a critical care specialist in San Diego and lead writer of the task force report. The idea is to try to make sure that scarce resources — including ventilators, medicine and doctors and nurses — are used in a uniform, objective way, task force members said. Severely burned patients older than 60. Those with severe mental impairment, which could include advanced Alzheimer's disease. The list of those who would be denied medical care, due to rationing, is very similar to lists drawn up by countries like Australia, the UK and a number of South East Asian countries. The World Health Organisation is expected to endorse such a list in its pandemic preparatory literature and guidelines. Blood-engorged mosquitoes were collected at poultry farms during an outbreak of highly pathogenic avian influenza in Central Thailand during October 2005. These mosquitoes tested positive for H5N1 virus by reverse transcription-polymerase chain reaction (RT-PCR). Results were confirmed by limited sequencing of the H5 and N1 segments. Infection and replication of this virus in the C6/36 mosquito cell line was confirmed by quantitative real-time PCR. However, transmission by mosquitoes was not evaluated, and further research is needed. Collecting and testing mosquitoes engorged with the blood of domestic or wild animals could be a valuable tool for veterinary and public health authorities who conduct surveillance for H5N1 virus spread. Bird Flu Scares "Are A Conspiracy To Make Money"
The former chairman of the Pakistan Poultry Association, Khalil Abbasi, isn't buying any of the talk about bird flu becoming a pandemic that could devastate humanity. 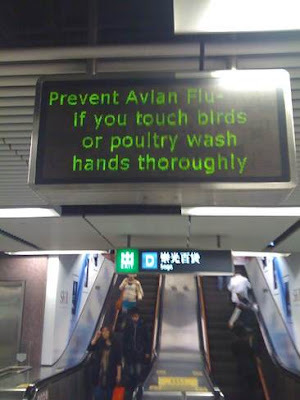 “The bird flu hype is part of the media campaign of a US-based commercial enterprise, which has former US defence secretary Donald Rumsfeld as president. All of this is being done merely to boost the sales of its product ‘tami-flu’,” Abbasi alleged. He said that the H5N1 (bird flu) virus was first detected in Scotland in 1960 and it still exists in Great Lakes area of the USA, but it was “overplayed” when it hit Thailand and other Asian countries. “Why are we assuming that the virus would turn ‘vicious?’ This is a fallacy because no human transmission has been reported so far in the world,” Abbasi said. PPA chairman, Abdul Basit, said that since 2004, bird flu fears had caused losses worth billions of rupees to the poultry industry. This, he said, had resulted in the closure of 40 percent of farms. “Hundreds of thousands of workers have lost their jobs only due to ‘sensational news’ because no human infection has been found so far in Pakistan,” Basit said. There are around 25,000 poultry farms in the country, employing over 1.5 million people with an investment of around Rs 200 billion. Approximately Rs 45 billion to Rs 50 billion worth of agricultural products and by-products are being used in poultry feed, the PPA chairman said, adding that the poultry crisis would ultimately compound the agricultural crisis. A vaccine is available to effectively control the virus in birds, and effective use of this vaccine in Pindi, Islamabad and Abbotabad has controlled the disease in those areas. Karachi will follow suite soon, Basit said. One of the speakers at the press conference blamed the media for “over-emphasizing” the fears of bird flu. This led to a heated exchange between poultry and health officials and journalists present there. Before Donald Rumsfeld became US Secretary of Defense, he brought shares in an American pharmaceutical company that helped in the development of Tamiflu. Rumsfeld still held those shares when the US government began talking up the threat of bird flu, primarily, in 2005. Increased sales of Tamiflu in the United States, and around the world, saw Rumsfeld's shares generate millions of dollars in returns. With cullers and health care workers in India sent into numerous 'hot zones' in the past two weeks to deal with bird flu outbreaks, and with many lacking even the most basic safety equipment (face masks, gloves) it was inevitable that some would end up catching the virus. Indian authorities may be, and hopefully are, exercising extreme caution now, but holding dozens of people under quarantine, and monitoring hundreds more, you would expect that India will be announcing a number of human bird flu deaths in the coming days. India has put 26 people in isolation with bird flu symptoms and hundreds more people are being monitored, officials said on Friday as Pakistan and Thailand reported outbreaks of bird flu in poultry. India is battling its worst outbreak of avian influenza, which has spread to 13 of West Bengal's 19 districts. The densely populated state is adjacent to Bangladesh, itself trying to control a major outbreak of bird flu, and has millions of backyard fowl. In West Bengal, veterinary staff have culled 2.6 million birds, completing what officials said was a successful operation that had brought the bird flu situation under control. The focus now is on hundreds of medical and veterinary workers and villagers who had come into close contact with dead or sick birds. Officials said health staff returning home after the culling operation had been asked to get themselves checked. Dozens of isolation wards had been created in hospitals in the affected districts to handle any sudden rush of suspected human cases. Health experts also worry about the situation in Bangladesh, a crowded country of 140 million people where bird flu has spread to nearly half of the country's 64 districts. 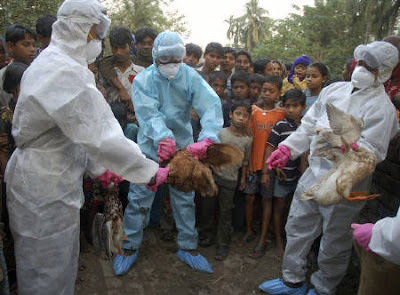 Livestock officials said bird flu was still spreading and had resurfaced in the Feni district southeast of Bangladesh's capital, Dhaka. The government has ordered culling of all chickens and ducks in one kilometre radius around affected farms. The virus is threatening the livelihoods of millions of people reliant on the country's poultry industry and driving up food prices. "Now we are facing a critical situation, as bird flu struck at a time when commodity prices from rice, flour to milk powder and edible oil had already nearly doubled," said Shahedul Alam, a government employee. Egg exports from the world's second largest producer have dropped about 50 percent in the past two weeks, leaving the industry with losses of around $20 million, trade officials said. India is now ground zero for a widespread human bird flu outbreak, or pandemic. How India deals with this crisis, and winds back the spread of the virus to more than 75% of the country, and whether or not such widespread exposure to the virus will result in many human victims, will tell us a lot about how serious bird flu may become in 2008, and how effectively current control measures and guidelines are for dealing with outbreaks.